The global sports medicine devices market is expected to find players undergoing consolidation causing the development of its oligopolistic nature. Leading players could concentrate on product differentiation, advertising, and marketing during their stay in the market. In a report by Transparency Market Research (TMR), prominent names of the market such as Össur hf., DJO Global, Inc., and ArthroCare Corporation are closely studied in the company profiling section. In the recent past, the market witnessed an acquisition agreement made between Smiths & Nephew and ArthroCare. Complementary product portfolio organized after the acquisition is anticipated to expand product pipeline and improve revenue. 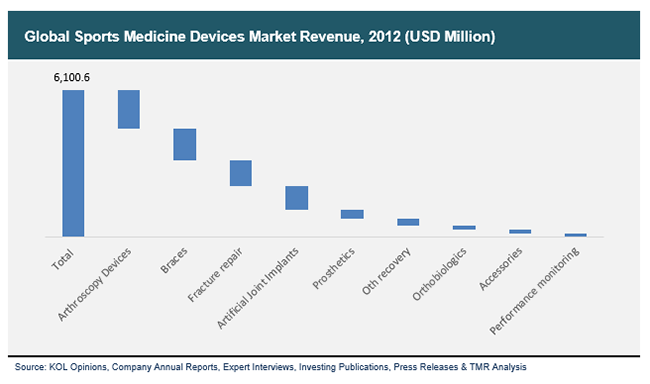 TMR foretells the global sports medicine devices market to bag revenue earnings worth an US$8.2 bn by the completion of 2019. On the basis of orthopedic product, arthroscopy devices could continue taking a larger share of the market in the near term. In terms of region, the market is predicted to testify the rise of North America as a leading segment. Support gained from online marketing is supposed to bode well for the world sports medicine devices market. However, there are some more important factors that could tellingly enhance market growth in the foreseeable future. For instance, encouragement given to the specially-abled to participate in sports activities could not be turned a blind eye to. Furthermore, rising awareness about fitness and health among the elderly and increase in the count of sports medicine associations are projected to set the tone for valuable growth in the market. There are some orthopedic products that could showcase increasing demand in the world sports medicine devices market – for instance, arthroscopy devices. On the other hand, the prosthesis market is foreseen to exhibit a slow pace of growth. However, demand in the global market could increase on the back of the impressive rise of braces as star segment under support and recovery products. Growth of the international sports medicine devices market is forecasted to slump due to decreased budget allocation for sports. Moreover, dearth of reimbursement policies reserved for academic sports injuries could apply brakes on market growth in the coming years. However, introduction of novel implants and prosthetics and development of performance monitoring equipment are envisaged to create ample of opportunities in the market. Rising frequency of sports injuries in Asia Pacific and another region of the market could help with the demand for sports medicine devices. Technological development on the part of joint repair implants and demand for minimally invasive procedures are envisioned to be other factors pushing market growth in the next few years.